The law relating to town and country planning has a major impact upon the physical environment and affects private citizens, landowners and developers alike. This third edition is a comprehensive text for students, practitioners and members of the general public on this difficult area of law. Following the Planning and Compulsory Purchase Act 2004, the third edition of Planning Law and Practice contains a complete revision of plan-making and the control of development as well as incorporating recent case law. Together this provides up-to-date details of the operation of the current English planning system. The successful format adopted in the first edition of this book, which was awarded the Gold Award for Best Reference Work by the Chartered Institute of Building in 1999, has been retained. Planning legislation is dealt with in the main chapters, while further chapters use relevant case law to amplify the sometimes complex statutory material. 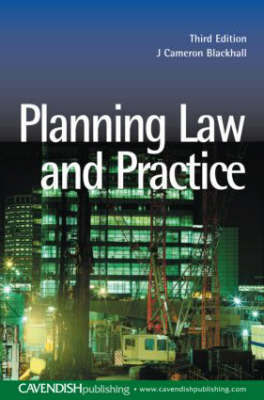 In addition, the book outlines other areas of land law such as European legislation, non-planning controls and public investment.